← New Garden in One Morning! Radishes are one of those vegetables that most people either like or don’t like. However, most of the time they just get eaten whole as a snack (usually with dip) or on a salad. 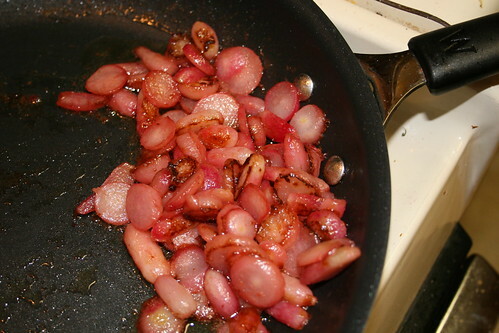 For whatever reason, cooking radishes isn’t something most people even consider. 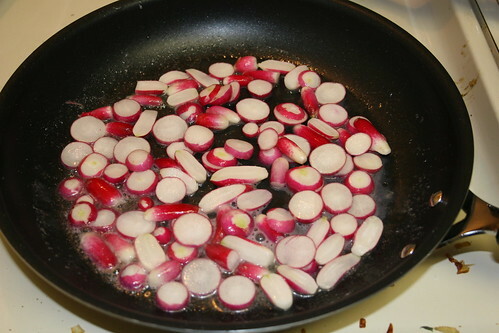 It is more common in Asian cooking with the daikon radishes. A few weeks ago, when I was thinning out the radishes from the radish-parsnip planting experiment, I decided I needed to try a recipe that I saw in a magazine earlier this spring. 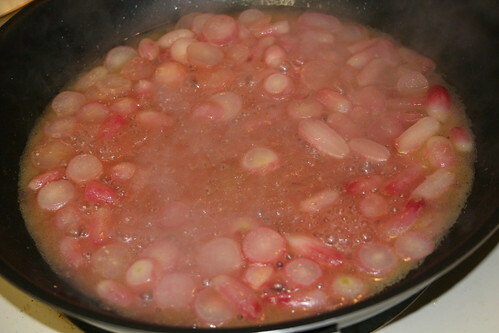 The recipe is Butter Braised Radishes from Fine Cooking. I didn’t have quite that many radishes, and they had been in the refrigerator for over a week by the time I got around to them, so I didn’t save the tops to put in at the end. I sliced up the radishes. The French Breakfast radishes I sliced in half the long way. These were the first thinning, so a lot of the radishes were pretty small. Into the pan with a little bit of butter! I suppose you could use olive oil or some other fat if you want to. After they were partially cooked, I added the chicken broth. They simmered away nicely, giving everything that nice pink hue. Then the vinegar and seasonings are added and cooked down until everything is glazed up nicely. Here they are after all the liquid was cooked down. They got some nice color on them. Here is one portion dished up in a bowl. I wanted to make it look “spiffy” and so I “garnished” it with a spinach leaf from our salad to take the picture. It needed a little green, since I didn’t save the radish tops to put in. The flavor was interesting…maybe a little bit like turnips? I know that isn’t necessarily a selling point. But they are cousins, so it would make sense. The chicken broth overpowered the flavors a little bit, but the vinegar helped cut it somewhat. I don’t know that it really needed the little bit of sugar. 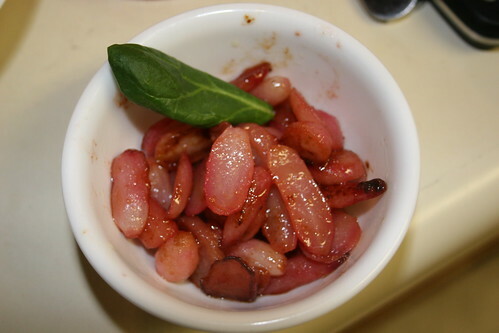 Anyway, if you are bored with raw radishes, this is something to try! It is a pretty simple recipe and fairly quick. Once you’ve got the hang of it, I would try adding some different flavors or trying different vinegars or braising liquids to give it a different twist. Posted on May 23, 2013, in Harvesting & Eating and tagged cooking, radishes, Spring. Bookmark the permalink. Leave a comment.